Ellie Overholt is off to spend the summer in Norway with her grandmother, where she hopes to find some freedom from the watchful eye of her overprotective older brother, Graham. That isn’t going to be easy, with both Graham and his friend, Tucker, slated to join Ellie in Norway. She may have to play the role of protector for once, though, when the young men of the village start disappearing, Graham among them. Ellie quickly learns that some myths are all too real, and that she herself is a part of them. With the help of her newfound powers, it’s up to Ellie to find out what’s going on in the village and to rescue her brother. 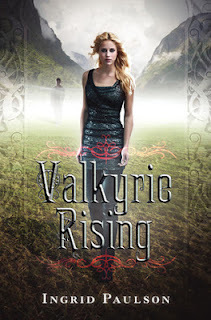 I didn’t know much about Norse mythology before reading Valkyrie Rising. I was familiar with the basics (Odin, Thor, Loki, Valkyries, Valhalla), but that was about it. Valkyrie Rising presented a nice change of pace since I’d never read anything based on Norse lore before. While I liked how the book ventured into a world that was relatively new to me, the characters came up a bit short development-wise. To say that the protagonist, Ellie, lives in the shadow of her older brother, Graham, is an understatement. From the first chapter, the fact that he can do no wrong is made abundantly clear, so much so that I developed an almost instant dislike of him for being so ridiculously perfect. Not only does poor Ellie have to deal with Graham’s saintliness, but he’s also extremely protective of his little sister, to the point of being smothering, at least in my opinion. I understood that Ellie’s discovery of her superhuman abilities would seem all the more dramatic because she’d been lurking in the shadow of Graham’s reflected awesomeness for so long—it was. But I also spent a good number of pages feeling as though the book were about Graham instead of Ellie. I was happy for Ellie when she found out that she wasn’t an ordinary teenager. She really deserved to have a spotlight shone on her for once. I did, however, think that her transformation from mere mortal to warrior woman took place rather suddenly. That was my general problem with the novel: the characters and what happened to them weren’t explored in enough detail to spark more than a passing interest in them. Valkyrie Rising became considerably more intriguing once Loki entered the picture. I will not deny that I daydreamed constantly occasionally about Tom Hiddleston as I read Loki’s scenes in the book. This version of the character is every bit the shrewd trickster who only involves himself in situations that somehow benefit him. He was by far the most entertaining character, as well as the one who demonstrated the most depth and vivacity. Had the other characters been this fleshed out, the novel would have been more of the standout read that it had the potential to be. While this book didn’t quite bowl me over, I enjoyed reading about a setting that was brand new to me—the beautiful fjords of Norway. I also found it very refreshing that the guys were the ones who were in peril and required rescuing. The story, the mythological element, and the writing were all solid; the novel just needed its characters to have a little more substance to them. I really liked the novelty of reading about figures from Norse mythology, especially Loki, in modern times. Aside from him, though, the characters weren’t overly remarkable, keeping Valkyrie Rising in the above average rating range. I really like the concept of a book about Norse mythology. All of the mythology books I've read have dealt with Greek gods and their myths, and I've had really bad luck with all of them so far. A new set of gods and a new culture sounds fantastic! After I read this, Goodreads recommended me quite a few books featuring Norse mythology. It looks like Norse gods may be the next trend in mythology retellings. I hope you have better luck with them than you've had with Greek ones! I have heard that a lot from readers of this book..too bad Loki was middling! I wish that he'd had a bigger role; I think the book would have been more interesting if his appearances had been more frequent. I haven't heard mch about this one, but Loki and the setting sounds great. Reading this definitely made me want to see Norway's breathtaking scenery in person someday. I wanted to love it more, since I hadn't read anything like it before, but the characters were rather average to me.